George Graham Reviews Richard Thompson's "Electric"
Probably the most durably popular figure to emerge from the 1960s English folk-rock scene is Richard Thompson. With a recording career going back to 1967, Thompson remains creatively active and continues to have a good following. He has just released his approximately 14th solo studio album called Electric. By age 18, Richard Thompson was a founding member of Fairport Convention which emerged, along with the Pentangle and Steeleye Span, as one of the troika of English folk bands that defined the sound that continues to attract fans some 45 years later. At first, Thompson was mainly the guitar player, with the group originally being primarily a cover band, and the vocal spotlight on the remarkable Sandy Denny. Thompson's guitar work was one of the important elements in the band's early sound, being electric but quite wide-ranging. Thompson's guitar work influenced a generation of other artists including perhaps most notably Mark Knopfler of Dire Straits. But Thompson has come to be known as a prolific songwriter. He first began writing in Fairport, mainly because he felt that the band needed to be more than a cover group. His songs became staples with Fairport. By the time he left the band in 1971 to begin his solo career, his songwriting was front and center. He had a musical and marital collaboration with Linda Thompson during the 1970s, and when that fell apart, he continued to work as a solo artist, though he frequently collaborated on side projects. Meanwhile, many of his songs have been covered by artists including bluegrass veteran Del McCoury, R.E.M., Bonnie Raitt, Elvis Costello, Loudon Wainwright III, and many others. Thompson has been spending a most of his time in the US, having settled into Southern California, but his new album was done in Nashville with musicians from the city. Electric is well-named. While Thompson often appears in a solo acoustic setting live, he has always enjoyed rocking out, whether it was with Fairport back in the day or on some of this solo album projects. Electric was produced by veteran Nashville roots-rocker Buddy Miller, and features a couple of people known for their country and bluegrass work in Nashville, fiddler Stuart Duncan and bassist Dennis Crouch. One track has the backing vocals of bluegrass star Alison Krauss. Miller add some guitar work, but Thompson's trademark guitar sound is front and center, as are his occasionally-sardonic lyrics. The other players making up the core band are drummer Michael Jerome and electric bassist Taras Prodaniuk who has been part of Thompson's touring band. As mentioned, the album lives up to its title. It's some of Thompson's most rock-oriented material of his career, but there are also some laid-back pieces and one acoustic track. The cranked up performances don't interfere with the songs. Thompson's lyrical and vocal strengths are unimpeded, and he sounds as if he is enjoying himself, even while relating his lyrical twists and turns on relationships. And in that respect, Thompson's fans will find themselves in familiar territory, with a number of songs bearing some lyrical narrative resemblance to topics he has addressed before. But it's all very well done and Richard Thompson is being Richard Thompson on the new CD, Nashville environs notwithstanding. Richard Thompson's new CD Electric sees the veteran British singer-songwriter and guitarist in Nashville playing a kind of cranked-up breed of roots rock. Produced by Buddy Miller, who knows a few things about this kind of music, the result is quite effective. The electric energy is there without undermining the songs. The band is tasteful and Thompson's guitar work is up to his usual standards. But except for the surroundings, this CD is not one of Thompson's more creatively ambitious recordings. Lyrically, he stays in familiar territory, relying more on his musical and lyrical trademarks than on breaking any new ground. Of course, when you've written as many songs as Richard Thompson has, you're bound to end up revisiting some concepts. But it's first-rate in musical execution and quality of material. Sonically, we'll give the album about C-plus. The mix is commendable, with everything being audible and in about the right place, but the recording was done in Buddy Miller's all-analog studio, obviously cranking it up so that the analog tape was over-saturated with the accompanying distortion, plus some buzz, background noise, and generally murky sound. Some people think that misusing old analog equipment is somehow cool, but it's the sonic equivalent of going back to an old black-and-white TV set. The recording is also badly overcompressed. 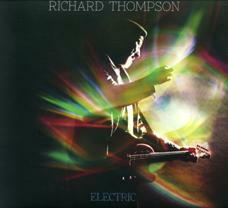 Richard Thompson's new CD Electric is one that should give his many fans a new fix of his distinctive music. It may not be his very best, but Thompson again proves he is among the most engaging singer-songwriters on the scene and his durable popularity is well-deserved. (c) Copyright 2013 George D. Graham. All rights reserved.